Marquis will continue its latest exhibition promotion for the new Aquatic Training Vessel (ATV) during The Pool & Spa Show in Atlantic City before returning to the UK for SPATEX this weekend. The WhatSpa? Award-winning manufacturer has sandwiched in the USA exhibition, organised by the Northeast Spa and Pool Association, in the Atlantic City Convention Centre between last week’s UK Pool & Spa Expo and the forthcoming SPATEX return to Coventry. During the exhibitions, Oregon-based Marquis will be highlighting the partnership with Dave Scott, the First Inductee to the Ironman Hall of Fame, to promote the new ATV to prospective retailers. In special videos Dave will focus on benefits for users who are training for competition, pursuing higher fitness, working on injury rehab, or generally improving their overall health. “We’re very pleased to take the next exciting steps in our collaboration with Dave,” revealed Marquis Vice President, Marketing, Jim Johnston. Coming in at 168.5” x 89.5” x 56”, the ATV is currently on its latest leg of exhibitions across the globe after officially being launched to the trade audience at the International Pool Spa Patio Expo in Florida in November, followed by a high-profile European launch at the Piscine Global exhibition in Lyon ahead of its British debut at the UK Pool & Spa Expo. 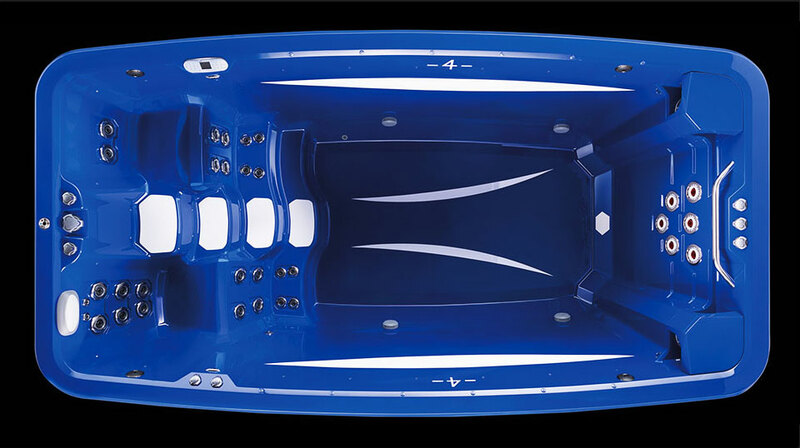 As well as utilising state-of-the-art polymer resins that are used in the marine industry’s most expensive and rugged boat and yacht hulls, the ATV’s covalently bonded macromolecular structure makes the vessel impervious to the crazing and cracking found in typical acrylic swim spas. The sweeping lane lines and other visual focal points for workouts are not superficial appliqués that can peel or degrade over time. They are securely bonded into the polymer structure of the resins and last as long as the vessel itself. After the ATV made is British debut at the UK Pool & Spa Expo, Marquis Spas Director of Global Sales Steve Hasenmueller donned his swimming trunks and provided a full demonstration of water training routines that can be performed by all age groups, including swimming, walking and rowing. He highlighted that traditional swim spas struggle to sustain structural strength with the potential for acrylic sheet to waver and distort during shipping and installation, and under the weight and pressure of so much water over time. 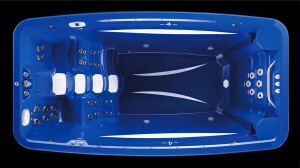 The ATV’s external frame, though, is a uni-body gusset construction that assures greater structural integrity and rigidity to further support the vessel’s bonded polymer resin strength. “We have secured a sale for the ATV in Wales from a married couple in their 70’s that just wanted to be the first to purchase it and didn’t even know the price,” reported Steve. Marquis will be on Stand 1907 during The Pool & Spa Show in the Atlantic City Convention Centre this week. Opening times for visitors will be from 11am to 5pm on January 27 and 28. On the final day, January 29, the Exhibition Hall will be open to visitors from 10am to 2pm. The Marquis exhibition stand at the Ricoh Arena in Coventry during SPATEX will have the ATV on display and will also be promoting increased UK sales, booming demand for the Microsilk technology in hot tubs and the manufacturer’s entry-level product line, Celebrity Hot Tubs on Stand C63a. SPATEX 2015 opening times for the first two days of the exhibition at the Ricoh Arena will be 9:30am on Sunday, February 1 and Monday, February 2. Both days are then scheduled to officially finish at 5pm. In keeping with tradition, there is a shorter day on the third and final day of SPATEX on Tuesday, February 3, which will be the inaugural ‘Spa Day’ running from 9:30am to 4pm. Filed Under: Event news, Events & expos, News, News & views Tagged With: Aquatic Training Vessel, Marquis Spas, SPATEX, The Pool & Spa Show, UK Pool & Spa Expo, WhatSpa?